The first two nights in Paris during my five-night stay over the October holidays were pretty busy with sightseeing and (lots of) eating. This isn’t to say that the next three nights were calm, though– in fact, I still did quite a bit, all the while balancing it with day trips to other places in northern France (which I’ll recap in later posts). Following my second night, I spent most of the following day on a day trip to Château de Chenonceau, one of the most famous châteaux in the Loire Valley. Getting there by public transportation was a bit tricky, as I had to transfer between trains, and hours were limited. That said, I returned to Paris in the evening, grabbing a kebab on the way back to the hostel where I met up with the traveler whom I befriended the night before. The next day was a jour férié (observed national holiday). Originally, I’d planned on doing another day trip, but I decided to stay in Paris instead, as places (e.g. museums, restaurants, even transport) would be limited if I’d chosen to go out of the city. 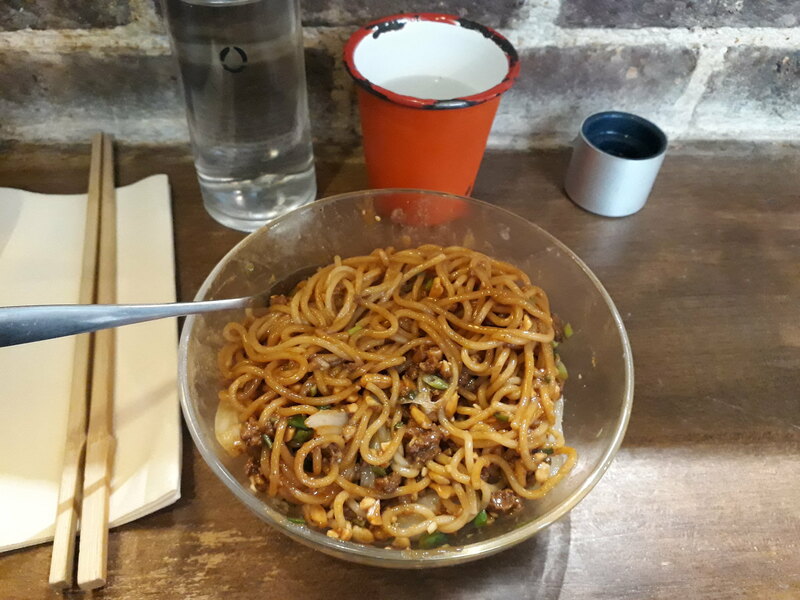 I still managed to occupy my time, though, as I got lunch at a Szechuan restaurant: the dan-dan noodles were just the right amount of spiciness for my taste (and tolerance level), as I’d opted for a level 2 on a 0-5 scale. I was also surprised just how popular the place was, Chinese, French, and tourists alike. The food was simple, but so good! 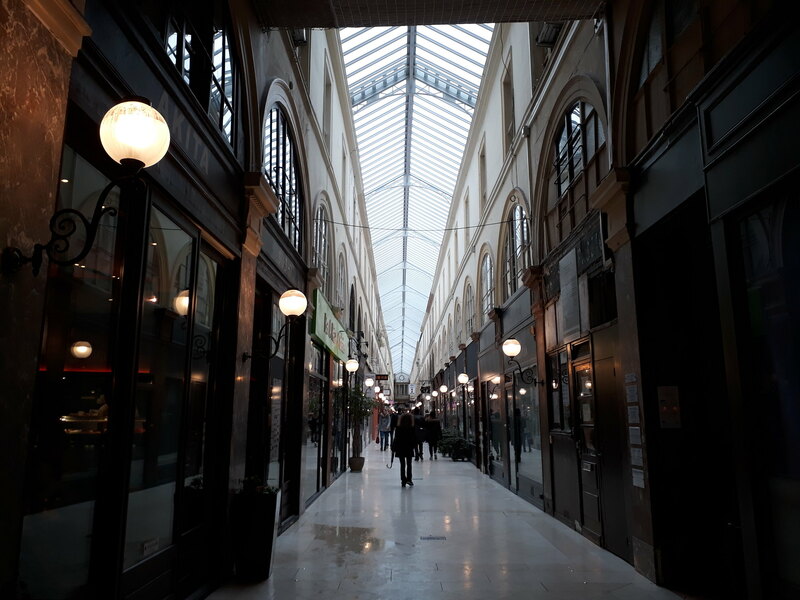 Following lunch, I passed through the lovely Passage Choiseul before making my way to the Printemps Haussmann, a fancy department store that rivals the Galeries Lafayette just next door. Likewise with its rival, it also boasts free views from the terrace on the 9th floor. 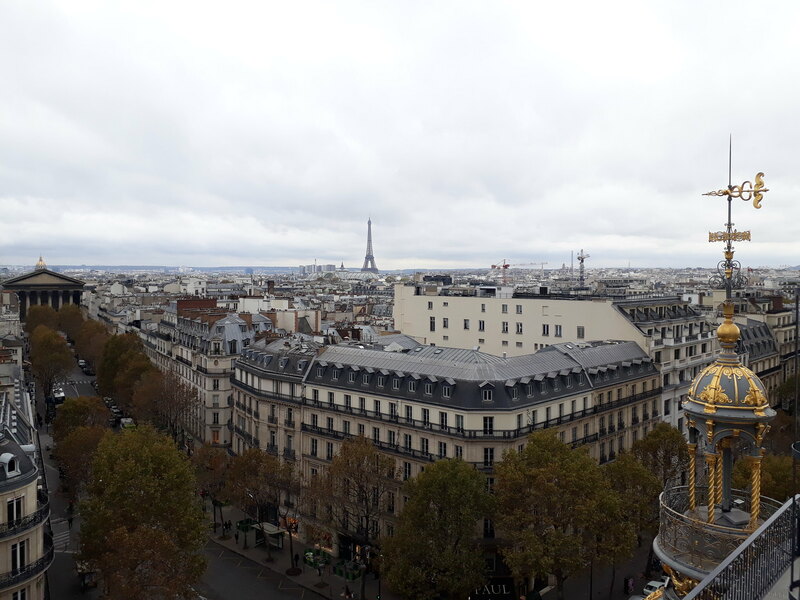 That said, I took the escalators to the top, and I was dazzled by the lovely views of the Eiffel Tower, the Madeleine church, and overall the elegant Haussmann architecture that’s classic of Paris. Very much enjoyed the breathtaking views (and for free)! 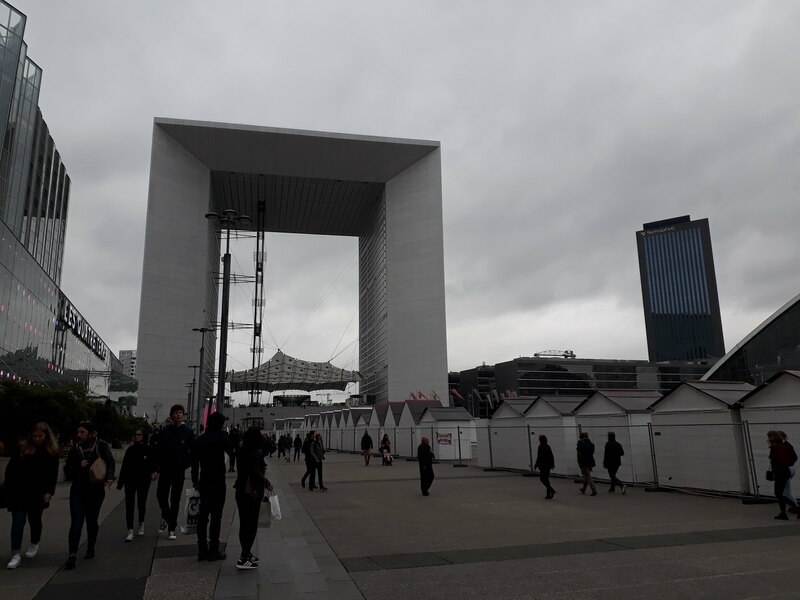 I then took the metro just a bit outside of Paris to La Défense, the commercial/business center of the Paris metropolitan area. It’s known for the Grande Arche, a massive, modernist arch that’s supposed to mirror the classic Arc de Triomphe near the Champs-Élysées. 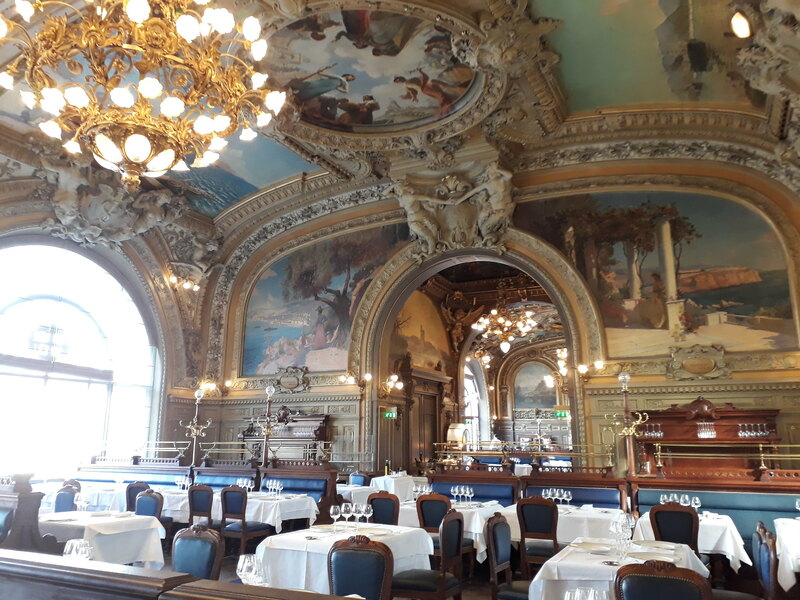 It was interesting seeing a part of the Paris area that’s far-removed from the historic, classic architecture and more of the modern, urban feel– while I wouldn’t choose to return, it was an interesting experience! Returned to my hostel afterwards, and I rested until 19:00, when I headed out to the Buttes-Chaumont area for a drink with a friend who lives in Paris. We didn’t stay out too long, since she had work the next day, but it was pleasant catching up after several months apart. 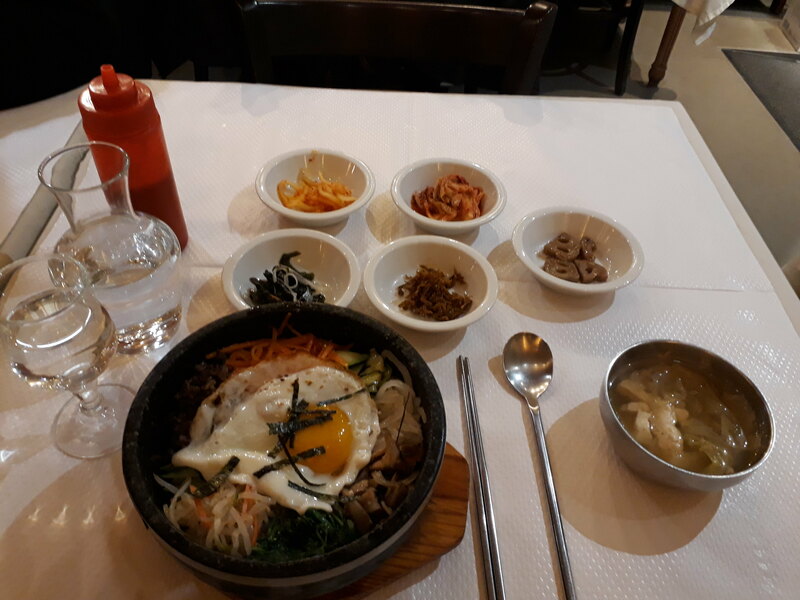 I did a day trip to Reims the following day and upon returning to Paris, I got dinner at a Korean restaurant, which is reputed to be one of the best (and most popular) in the city. I got there before they opened, and I got a seat inside– perhaps because it was Friday night, or maybe it’s just that popular, but within 20-25 minutes of opening, there was already a line of hungry customers outside the door. I admit, the food was pretty good: the bibimbap was hearty, and I was contently full afterwards. 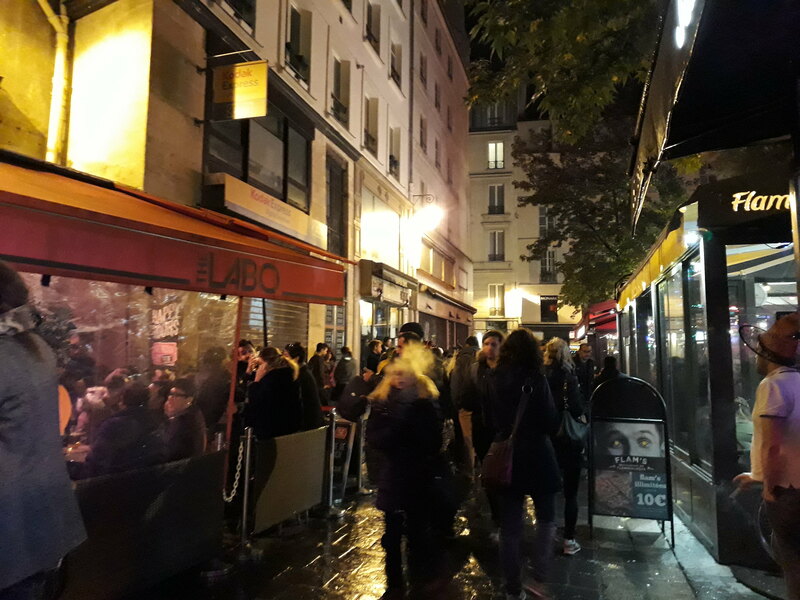 Considering it was my last night in Paris, I wanted to check out some of the nightlife– more specifically, the LGBT nightlife. As I identify with the community, and the fact that I had limited experiences with it, I was definitely curious in checking it out. The first bar I went to was pretty much empty, as I arrived much too early for anything to happen– I just got a drink and left. Although I was thinking of just turning in afterwards, I ended up checking out another LGBT bar, which happened to be hopping when I arrived. I ended up striking up conversation with someone who happened to take a seat next to me at the bar, and then with her friend when she arrived. After a few drinks, we danced and saw some, erm, interesting things on the dance floor…her friend left early, so we stayed a bit longer to continue dancing before leaving half-past midnight to catch the metro back to our respective places. We ended up exchanging contact info, and perhaps we’ll see each other next time I’m in Paris (I hope to!). …and that concludes my time in Paris this October. I left the next day to take the train back to my city, thereby ending my week-long vacation. It’d been a good time, although I’d say that I spent too much money (and will subsequently have to budget for my next trip). I got to visit (and revisit) great places, meet loads of people, and eat lots of good food. Definitely got me in better spirits, and I was much-more relaxed overall. I’ll be posting my day trips from Paris soon, so look out for them!